Unfortunately, our review of Ocean Reef casino was premature and after few months of operation, the casino seems to be on it’s way down. Therefore, we cannot recommend it to any player. If you are looking for a solid RTG brand, please visit Raging Bull Casino (link to the review). You can try it out with a $50 No Deposit Bonus. With a very nice nautical theme that features treasure chests, a coral reef background and dolphins, Ocean Reef Casino is well designed to make the players feel as if they are at luxury tropical locations. You can play using the Instant play mode or by download the casino software. If you wish to play the no download version, look for the Instant Play button in the top right corner of the screen. Slots make up the biggest part of Ocean Reef Casino libraries and the selection grows every month. The website is home to all RTG Real Series Video Slots in addition to several classic 3-reel slots. In total, you have 200+ real money casino games to choose from. The most popular games includes: Coyote Cash, Jackpot Pinatas, T-Rex and Cleopatra’s Gold. Ocean Reef Casino also has diverse ranges of the virtual table games which includes multiple variants of 21 like Face Up 21, Match Play 21, Pontoon and Blackjack Perfect Pairs, roulette games like American Roulette, French Roulette, Roulette Multiplayer and European Roulette and many more such as Sic Bo, Craps, Tri-Card Poker, Baccarat, Vegas Three Card Rummy, War and Pai Gow Poker. The video poker library found at Ocean Reef Casino is among the largest on the website. It ranges from traditional (Deuces Wild, Jacks or Bette, Bonus Poker and Joker Poker) to the unique ones (Pick’em Poker, Bonus Deuces Wild, Mystery Bonuses Poker and a 7 Stud Poker). A lot of these can be played in multi-hand and single-hand denominations. They also feature 2 types of bingo, Keno and few scratch cards games. 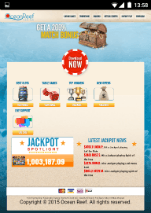 Ocean Reef Casino has a number of great bonuses to offer both new and existing players. The promotions continue with the daily deposits bonuses that are based on the sizes of the transactions as well as other weekly rewards. First, Ocean Reef Casino allows you to test the games with a $10 free chip. Don’t expect to win much on this one since the wagering requirements are very high – x100 the bonus, and the maximum cashout is $50. That’s just a fun way to play for few minutes and check things out. Then, new members can claim the ‘Lucky 7’ bonus pack which is set of 7 deposit bonuses. Your first 3 deposits will be tripled in their value up to $1,000 maximum each. After this has been done, the subsequent 4 deposits are then doubled in their values up to $500 each thus giving a grand total of $5,000. Each day, players are able to boost the amounts deposited by using the 3-tier Daily Bonus. Deposit between $50-$99 and get 77% bonus. Deposit between $100-$199 and get 137% bonus. Deposit above $200 and get 177% bonus. The wagering requirements on this bonus are again 40x Deposit+Bonus. Pay attention to Monthly Cashback bonus and Free Slot Tournaments. Ocean Reef Casino processes all its transactions in USD. As in most USA online casino, the main deposit options are Visa and MasterCard, followed by MoneyGram, Western Union and various ewallets. The minimum withdrawal amount is $100, while the maximum withdrawal per request is $3,000. The withdrawals are processed within 3-5 days, which is better than the US casino average of 5-10 days. In order to make sure that withdrawals request is successful, one has to ensure that their bank accounts can accept different international transactions. All the sensitive areas of Ocean Reef Casino lobby have been encrypted with ironclad SSL encryptions (1025 bit RSA key exchange and 448 bit Blowfish). This prevents anyone from reading private information. In addition, the servers are protected with enterprise-level firewalls so as to stop hackers from compromising the accounts. The RTG games are audited routinely by TST; one of top third-party auditors found in online gaming industry. Players are therefore assured that every game that they play will be very fair and genuinely random. Ocean Reef casino is available on all mobile devices, Iphones, Ipads, Android, etc.. The mobile design is very atrractive and the site is easy to very friendly and easy to use. There over 40 mobile slots available and 20 other casino games. Ocean reef casino offers the players with excellent choices of great bonuses, RTG games and a 24/7 support. 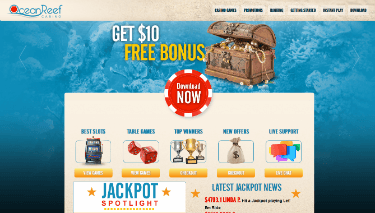 You should therefore take advantage of the $10 no deposit bonus and check this US friendly casino.